Though multifaceted, this project is defined by the screened in porch. By enlarging and refinishing the entry courtyard and carport, and new chic fencing in the front, we boosted the style and security of this home’s exterior; but the palatial screened-in porch is what steals the show, by providing an expansive garden retreat in which to eat, relax and enjoy. Bringing the outdoors in was at the heart of this project, and natural elements are highlighted throughout. From the warm wood that defines the space, to the screen walls that make the garden a part of the living space, nature is prioritized and highlighted. Modern touches and fixtures keep the space from feeling too rustic and add a bit of whimsical flair. 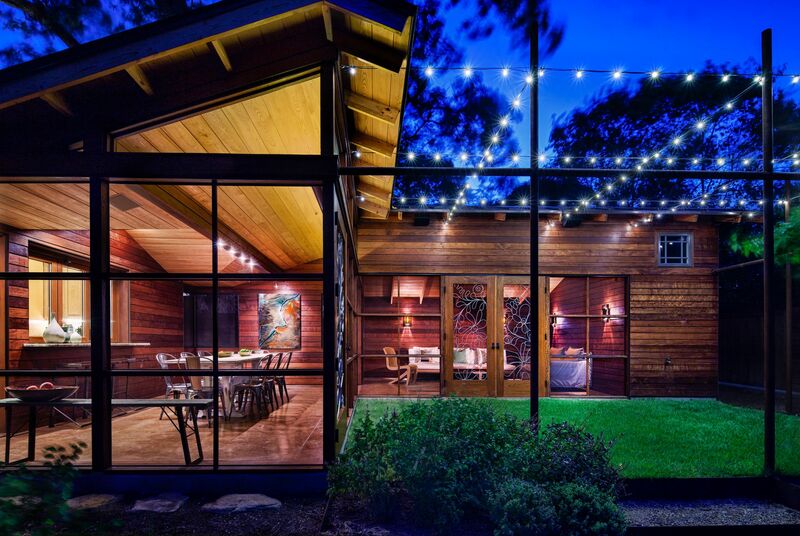 On the back of the home, a new screened-in porch was added to extend living and dining outdoors for all four seasons. These new spaces are designed to maximize the views of the garden and birds in flight. The new front entry is as stylish as it is secure, with new fencing and gates, as well as copper fixtures that add the finishing touches. 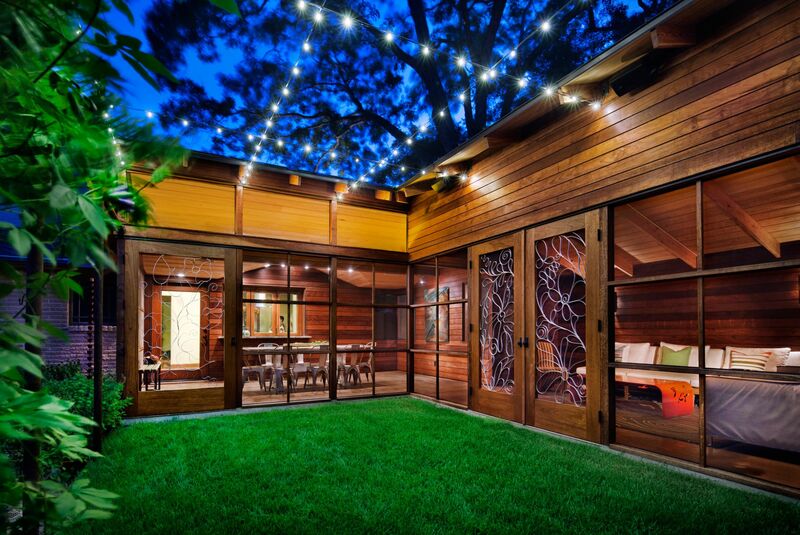 In the garden, exterior details further define the room and animate it after dark. The owners of this central city home originally parked on a concrete pad and entered their home through a gate and small entry courtyard. They wanted to enlarge the courtyard and add a carport for security, all while adding to the home’s curb appeal. Expert craftsmanship is evident in the wood used throughout the project. A dense wood, Ipe was chosen for its warmth and durability, and was used both as siding and decorative trim for the interior and exterior wall surfaces. The porch wall screens were built with aluminum frames and are removable for ease of cleaning. Custom designed screen doors with flower motifs complete the project. that facilitate connection and engagement with nature. The owners have already seeded the garden for a bounty of spring wildflowers and are planning to install a small orchard. Central city living at its best!